The MicroFISH Assay System condenses a FISH panel of up to 8 probes onto a single slide using just 1 microliter of cell sample and probe per hybridization. 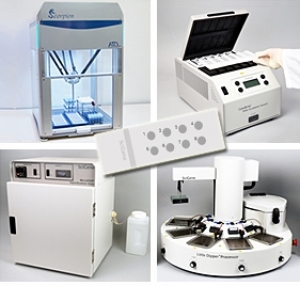 Labs can save up to $400 in probe reagent per panel. Uses a simple workflow so technicians can set up slides in a fraction of the time. Dispense 1 µl of fixed cells into wells to receive probe, pretreat if desired, then add 1 µl of the probe solutions. Place a single 22x50 mm coverslip over the wells — rubber cement is not required! Denature in the CytoBrite System then transfer to the humidity-controlled MicroFISH Hybridization Oven. 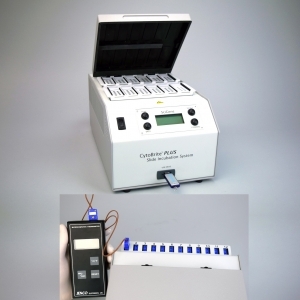 After probe hybridization, the Little Dipper Processor automatically shakes off coverslips then washes and dries slide ready for counterstaining and visualization. The optional Scorpion Robot automates preparation of 24 chromosome slides in < 10 min or 12 MicroFISH slides in < 30 min. It eliminates human error (i.e. sample or probe mix-ups) and produces detailed patient reports. It also monitors and tracks probe inventory and lot expirations to streamline ordering. Produces paper and electronic score sheets for each patient; ready for entering counts by the slide readers.